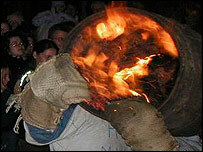 A 400-year-old flaming tar barrel tradition has come under threat because the Devon organisers cannot get insurance cover. Every year in November, burning barrels are rolled through the streets of Ottery St Mary, with some even carried on people's backs. Past events have raised thousands of pounds for charity. Organisers have not been able to obtain insurance this time because of a claim made after last year's event. With the claim being processed, the normal insurers will no longer provide public liability insurance which is needed should anything happen to an individual. Ottery carnival president Andy Wade, who heads the organising committee, said it was the first time he could remember a claim being made. He said they would continue to search for alternative ways of obtaining the correct insurance for the 4 November event. "It would be most unfortunate if it could not go ahead. I am convinced there is an answer out there somewhere," he said. The event was nearly cancelled in 2003 after insurers also pulled out. The tradition is believed to have originated from pagan rituals to ward off evil spirits.